Pendant Lights…Let’s Hang Some Elegance! These pendant lights are indeed very pretty. The great advantage of such pendant lights is that you can incorporate one or two lights and your area looks complete. The first one is like a flower in bloom and the second one seems as if it’s a geometric wonder of some architect. These are colorful lights which take their inspiration from the crown of a king. Infact, the bulb of this pendant light is inside a cylindrical color filter due to which the reflection of colored light falls inside the crown. Now that’s truly a smart technique. These are very elegant lights. The first one can be used in an array with similar lights or combination of others. A single piece of this costs you $595. The second one is from the idea of single ‘Edison’ bulb inside the pendant light. It costs you $ 475 each. This light named as pleat box is infact made up of ceramic with a variety of colors like brown, grey, soil, black and white. These are exclusively designed by joining hands with a master of ceramics Xavier Mañosa and a design studio with Marset. These lights are just like they are calling you towards a fairyland. They will shine in your room, living room, and kitchen or in your stairs and will spread the melodies. The first pendant light is having a mesh fabric which is fireproof. The second one is made of silken ribbons and last but not the least the third stunning light is made up of removable and washable elastic fabric. All the lights have a number of colors to choose from. Yes, it is reality. Now you can place your precious and beloved belongings inside a light that hangs just above your bed or dining table.Bring your precious possessions to lime light by placing them inside this pendant light. Wow ! 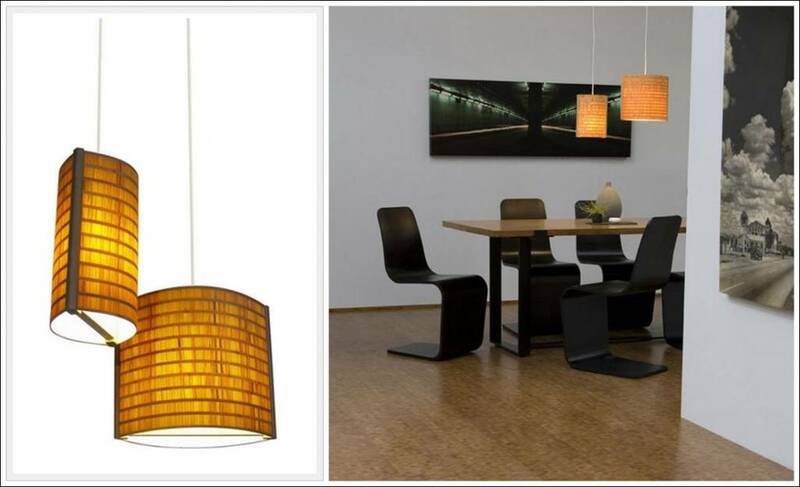 This pendant light is surprisingly made up of bamboo veneer shade that gives it this warm honey like glow. This lamp looks absolutely striking with black and grey interior of your room. The small one costs you $288 and the large one $318.